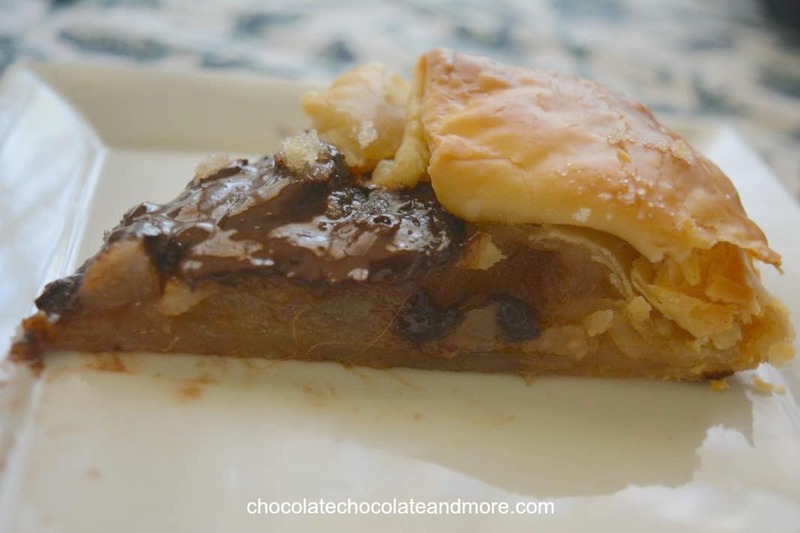 Chocolate Pear Galette - Chocolate Chocolate and More! 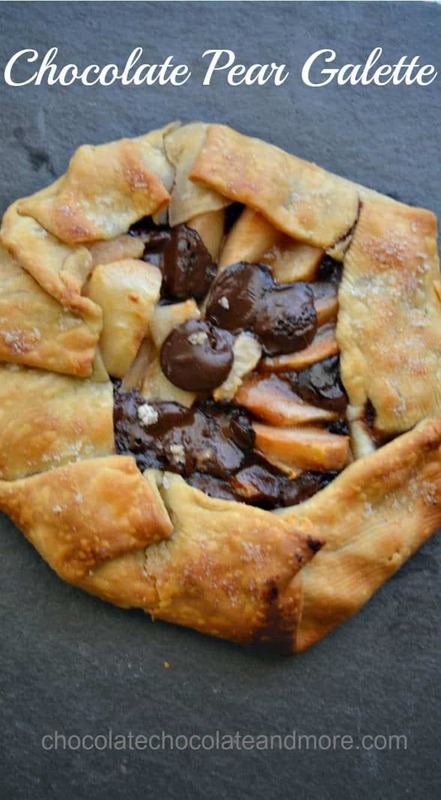 Fresh pears, dark chocolate and Nielsen-Massey chocolate extract combine for a wonderful, simple treat in this Chocolate Pear Galette. 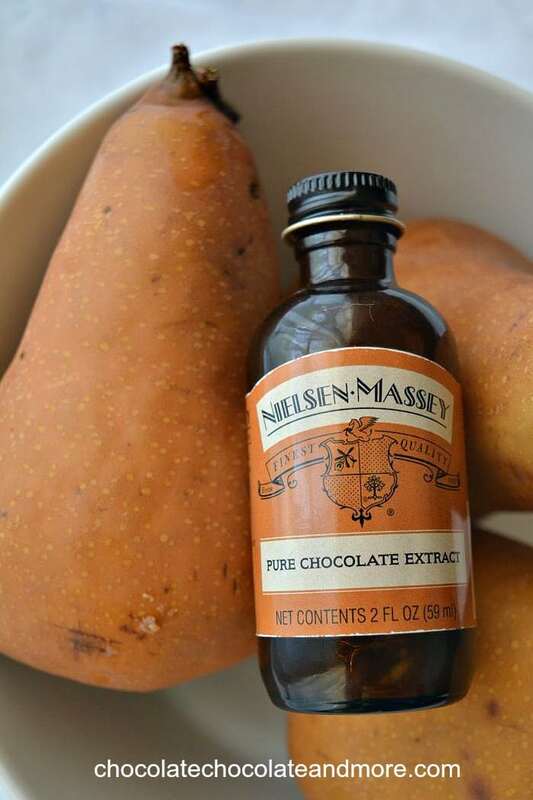 Nielsen-Massey is promoting kids baking this fall so they sent me some of their chocolate extract to try out. I love Nielsen-Massey flavorings. They may seem more expensive than some other brands but their flavors are so intense, you can use less. I used only 1/4 teaspoon in this recipe. Galettes are free-form pies. You just roll out your pie crust (or unfold a pre-made one), put the filling in the middle and then fold the edges up around the filling. They’re perfect for baking with children because they’re pretty fool-proof. Even very young children can arrange the filling on the crust and fold it over. I chose chocolate and pears for my filling partly because Costco just had a bunch of fresh pears and because chocolate and pear go so well together. Because pears are a mild flavor, you don’t want to overdo it with the chocolate. The chocolate extract gives just enough chocolate flavor that you don’t need to add too many chocolate disks. I made chocolate sugar in a ziplock bag. You can have your child measure the sugar and extract into the bag, seal it and then just squish it together until it’s mixed. You don’t really need to measure the chocolate sugar for the filling, you can just have your little one take pinches out and sprinkle them on top of the fruit until the bag is about half gone. Chocolate disks are also really easy for little hands to handle. If your child likes a little more sweetness, you could use semi-sweet chocolate chips instead of chocolate disks. Because the pears are already sweet, there is only just over 1 tablespoon of sugar in this Chocolate Pear Galette. It makes for a low sugar dessert that kids are sure to love. Line a baking sheet with parchment paper. 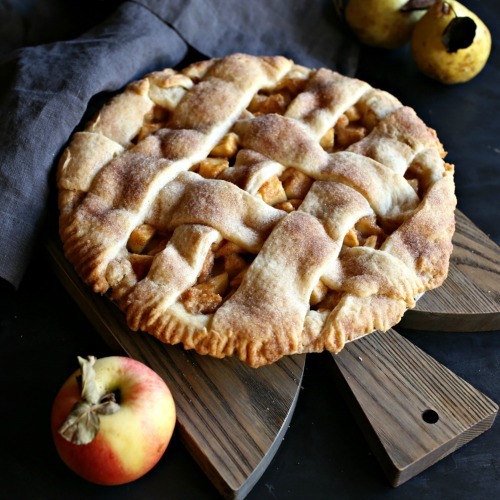 Unroll your pie crust onto the parchment paper and pinch together any holes. Arrange the pear slices in a single layer in the middle of the crust. Leave about 2 inches of the crust free around the edges. Put the sugar in a ziplock bag and add the chocolate extract. Mix together by squeezing the bag until it is all uniform. Sprinkle about 1 tablespoon of the chocolate sugar on top of the pears. I just used my fingers to take pinches from the spoon and spread it out. Spread the chocolate disks around on top of the pears. Fold the crust over the edges of the pears and chocolate. It will not completely cover the filling. Sprinkle the top of the crust with some of the remaining chocolate sugar. Bake for 20 minutes at 425°F or until crust is golden brown. Serve warm or cool completely and serve. You can bake the galette directly on the baking sheet but the parchment paper makes it easy to transfer to a serving dish.